Over the years I’ve attended countless functions at the Irish Consulate in New York, but never one as lively as the CD launch night for fiddler Marie Reilly from Longford. The reception room was filled with musicians, friends and well-wishers for the popular member of the consulate staff, who happens to be a very good traditional fiddler as well. This is very much in evidence with the release of her first solo recording Anvil. The album sheds light on the fiddling style of the Leitrim/Longford area of fiddle playing as revealed in manuscripts and music associated with Marie’s late father Michael Reilly, a blacksmith who also played the fiddle and taught Marie how to play and encouraged her music from an early age. Recorded and produced by Gabe Donahue in his new Philadelphia Cove Island Studio, it is an example of a home-made recording now possible without trying to please more commercially minded companies. This allows the artist to tailor their music to their personal choice and purpose, in this case to share some lovely undiscovered tunes and settings that were unique to the area where Reilly was reared. As such and with diligent liner notes, we come to know more about the musician and their music and to put it in a wider context. Research at the Irish Traditional Music Archive aided Reilly in producing this CD as well. 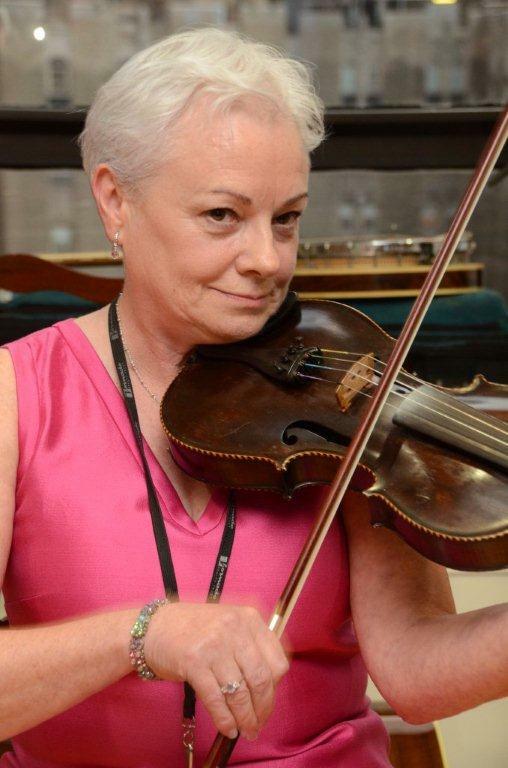 This coming Friday, the last Blarney Star concert before the summer break will put the spotlight on Reilly and her violin as Donahue accompanies her as he did on the recording. The mews house setting will be ideal to listen to Reilly tell us about the music and the chunes influenced her life, and also the opportunity to listen to her in a quiet setting. It starts at 9 p.m. at Glucksman Ireland House in Manhattan at 1 Washington Mews, just half a block from the Washington Square on Fifth Avenue. Visit blarneystar.com for more details. THE late teacher and writer Frank McCourt toiled for many years in the New York City school system and his union, the United Federation of Teachers, has just launched a lecture series in his honor. The inaugural lecture will feature Irish traditional music. Scholar and musician Brendan Dolan will exhibit in multi-media form “Gems from the Mick Moloney Collection” this Thursday at 5 p.m. at a free lecture hosted by the UFT at their headquarters at 52 Broadway. Dolan’s presentation will cover the history of Irish music in New York and America from the middle of the 19th century to the turn of the 21st century drawn from the voluminous collection compiled by the foremost expert on Irish American music, Dr. Mick Moloney, housed at Archives of Irish America at NYU’s Bobst Library in Greenwich Village. For more info call 212-598-7772 or visit www.uft.org . IF you want to be doing some spontaneous sean nos dancing by the time the Catskills Irish Arts Week rolls around in July you might want to sign on for a five week session with Siobhan Butler who is starting a beginners’ class on Saturdays from June 2-30 from 3-4 p.m. at the Times Square Arts Center (west 43rd Street and 8th Avenue) in Manhattan. Classes to live music by fiddler Tony DeMarco. For more email seannosnewyork@gmail.com.